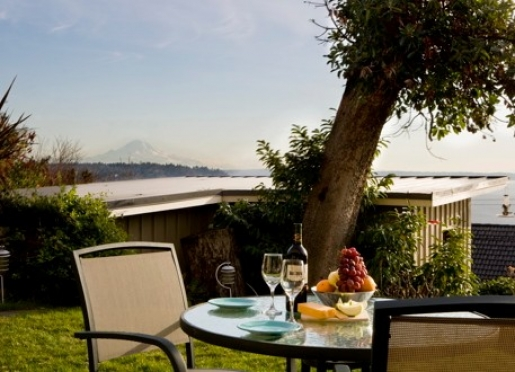 Three Tree Point Bed and Breakfast is a gem for your Seattle lodging with views of Mount Rainier, the Puget Sound and the Olympic mountain range. 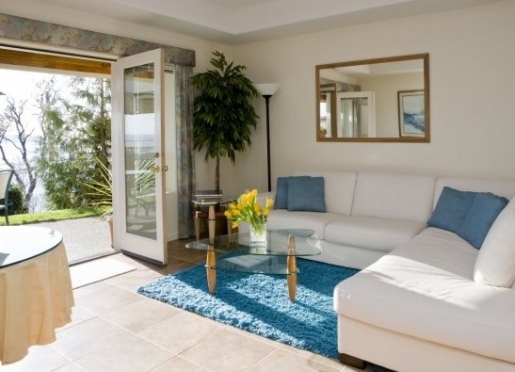 We have only two units, each having a private living room with a fireplace and a full kitchen stocked with a healthy breakfast, a bedroom with a view from the bed, private patio with a dinning set, and laundry facility. 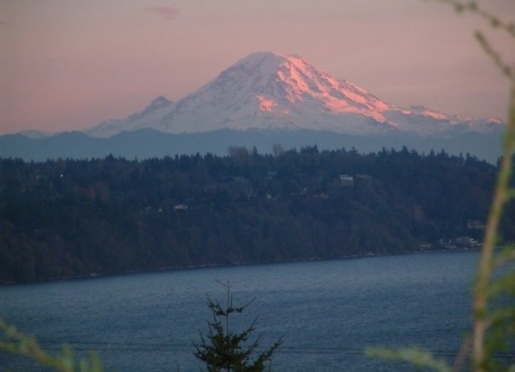 One can enjoy beach walks, Indian trail, hot tub, and located only 15 minutes from downtown Seattle, 10 minutes from the airport and 30 minutes from Tacoma. Your host Penny and Doug Whisler will do their best to guarantee a comfortable and enjoyable stay, they are available to help plan your trip as to what to see and do, where to eat and special event that are in town. Enjoy one of our many specials, dinner in, home made pies and cakes, picnics, flowers and chocolate, and/or stay 10 nights and the 11th night is free. 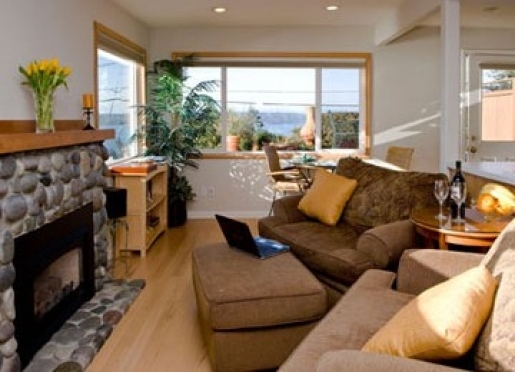 Want to different and unique Seattle experience stay at the Three Tree Point Bed and Breakfast. Travelers are always looking for memorable and relaxing experiences. Let’s discover more through the words of our innkeepers. Many thanks to Penny & Doug Whisler for sharing their secrets with BBOnline.com! 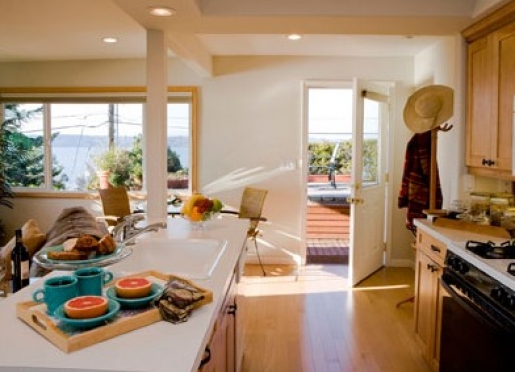 Travelers come to Three Tree Point B&B for a unique lodging experience during their visit to Seattle. They would like a home away from home with a kitchen, living room, bed room, outside patio all with a view of Mt. Rainier and Puget Sound. I am know for great hospitality, begin available but not in your way and my attention to deal, including everything you may need or want. Our unique Seattle inn is the only B&B with a view of Mt. Rainier, Puget Sound and Olympic Mountains. The thing I love most about our inn is providing a unique experience for each of our guest, if they are here for their honeymoon, vacation, romantic getaway, or business. Come to Seattle for the natural beauty, food, and enjoyable weather. The best compliment I receive is that I have thought of everything. I want you to have a stress free visit with us. Seattle best keep secret is the new Chihuly Garden and Glass. It is unique and colorful experience that all generation enjoy, located at the base of the Space Needle, it making a great backdrop for your photos. First day visit Mount Rainier. The wild flowers are beautiful during the summer. Visit Paradise and Sun Rise, take a walk and enjoy the up close view of the mountain. Second day, get on the water either by a boat tour (like Ride the Duck), by ferry, or by renting kayaks. We like to walk on the ferry, go over to Bainbridge and have dinner. Rent a kayak and paddle over to the Sleepless in Seattle house boat. Third day visit the Pike Place Market; take in the sights, sounds and smells. For those of you that are foodies, pick up some fresh fish and veggies, bring it home, put it on the barbeque and enjoy dinner outside on the patio. Forth day take a hiking in the Cascades. See one of the many water falls like Snoqualmie Falls, Twin falls, or take the Denny Creek trail up to Keekwulee Falls. A trip you will always remember. 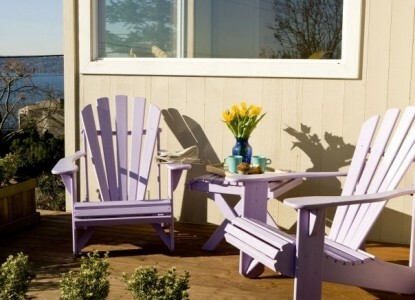 Enjoy beach walks along the Puget Sound from our B&B. Comb the beaches and find shells, sand dollars, and star fish, but leave them there to preserve the beaches. Walk up in to our local town of Burien for some dinner, shopping, or theater (about 2 miles). Our favorite restaurant/food in the area is Bistro Baffi or 909, about two miles away, sit outside, enjoy some tasty fresh food and meet some local people. 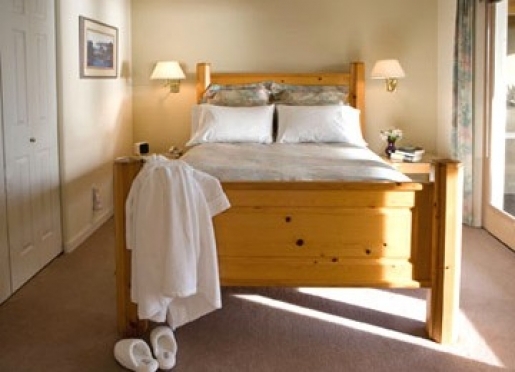 Three Tree Point Bed and Breakfast has 2 unites, the suite and cottage. Both are 800 sq ft. including a living room with fireplace, kitchen, (full stock with a healthy breakfast chooses), bedroom (California king bed and a view from the bed), 2 room bathroom, private patio (with a dinning set) and laundry facility. Yes, we welcome well behaved dogs. This is a very dog friendly neighborhood. Take a walk down the trail to the beach and let them play on the beach, swim in the salt water and bring them home for a gourmet dinner you can pick up at a local all natural dog food takeout. They will never want to leave. We can also recommend a doggie daycare for the days you can not take him/her. Breakfast is provided in your own accommodations for you to enjoy at your leisure. Your table, set with colorful Fiesta Ware, is enhanced with fresh cut flowers. 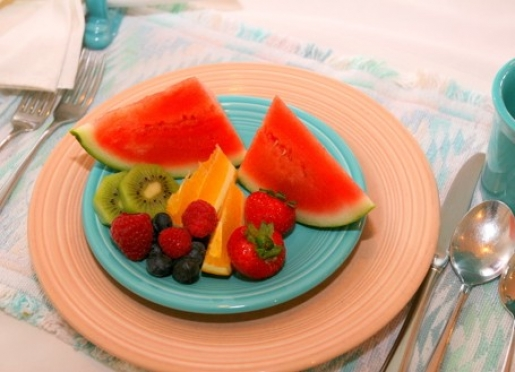 You will find a variety of healthy and delicious breakfast items in your kitchen. These choices include fresh danishes, fresh fruit, juices, Starbucks coffee, tea, hot chocolate, and hot apple cider. Yogurts and cereal are provided, including a various assorted toppings. Ingredients for apple pancakes, sourdough french toast, cheese omelet, eggs and toast are also provided. The menu changes daily and the refrigerator is restocked. 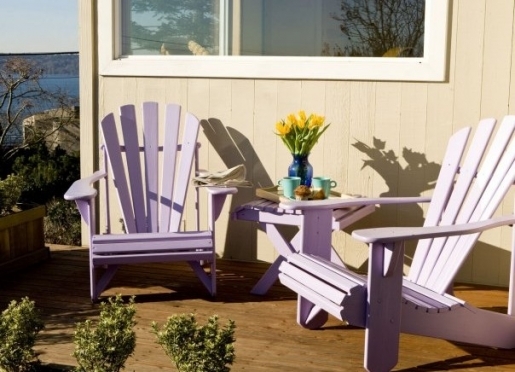 You may find it pleasant to dine outside on your patio on nice days. Hello, I'm Penny and this is my husband Doug and our two girls Braly and Brita. We are the innkeepers of the Three Tree Point Bed and Breakfast. 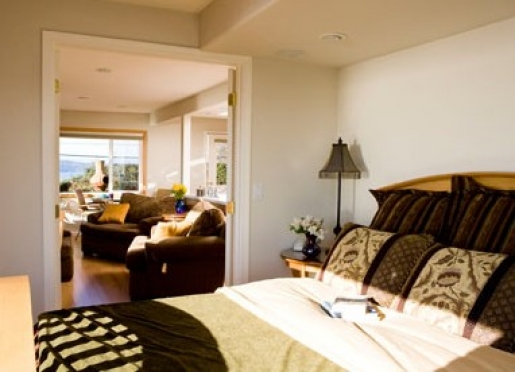 We hope you will visit our B&B while you are in the Northwest. Three Tree Point is the realization of our dreams. We enjoy providing a true "home away from home" experience for our guests. Doug works hard as a CEO for an Ultrasound Company. I was a mechanical engineer at Boeing for 8 years. We had our first little girl, Braly, in 1993 and our dream was to be able to stay home with her. The bed and breakfast has made this possible. Brita, our second daughter was born in 1996. Our family interests includes water and snow skiing. Christy You may be welcomed by Christy, our white German Shepard who has a preoccupation with tennis balls. She has been known to accompany guests to the beach (upon request) for a stick throwing / swimming game. There is also Miss Bobbie, our friendly feline companion chosen by our daughter on her second birthday. My love for what I do insures a personalized experience at Three Tree Point Bed and Breakfast. We continue to strive to improve our services and with fourteen years experience and insights from our guests, we want to guarantee your visit with us is memorable. As residents of the Seattle area for over 14 years, we find nothing more satisfying than sharing our knowledge and love of the Northwest with our guests. We recommend a minimum of three days to get a real flavor for the area. Catch The Spirit of Washington dinner train for an enjoyable ride up to the wineries. Or take a float plane over to the San Juan Islands for kayaking or whale watching. We have gathered the links listed below to help you plan your upcoming trip. Three Tree Point feels as if it's worlds away, yet it is only 15 minutes from downtown Seattle and 10 minutes from SeaTac Airport.